It’s the overlander’s worst nightmare: miles from nowhere, hot as hell, vehicle dead. And not just dead in the normal sense of the word, like a broken axle or sheared half-shaft, but irreparably dead, as in a seized engine, crashed vehicle, burned out wreck, or stolen by bandits. Farewell, Angelina. Time to be cool and calm. Brew a cup of tea, sit down in the shade, set up camp and elect aleader, then start putting together a strategy. A good mental attitude, high morale and the will to survive are all crucial elements in getting out of a dicey situation. In almost every part of Africa, there is likely to be a village or nomadic settlement somewhere nearby, and very few parts of Africa these days are not overflown by aircraft. The worst scenario is being hopelessly immobilized in the Sahara, the Namib, the central Kalahari or one of the remote deserts of northern Kenya or Ethiopia. If you are trapped in snow, as happened to several parties in Lesotho recently, stay with your vehicle. If your vehicle is white, rig a bright garment or other object on the roof to make it easier for helicopters to spot you. Run the engine for heat, being careful no exhaust fumes get into the cab, and never go to sleep with the engine running. Paint an SOS in the snow with tomato sauce. When venturing into deeply remote areas, always advise someone reliable of your intended route and estimated return date. Give instructions that if you have not made contact by a specified date, they should initiate rescue operations. It is wise in remote travel to take a minimum of two vehicles, preferably of the same make, model and fuel type. If you are travelling solo, link up with other travellers for tricky sections of your journey by passing the word around at campsites or hostels used by overlanders. Matches, in a waterproof container. Candles — for light and for starting fires. Magnesium flint and striker fire starter. 10 metres of light, strong nylon cord. A packet of condoms: These make excellent water bags and catapult elastic, and can be used to protect a wound. Steel fishing trace for setting snares. Strips of inner tube for making a catapult. Space survival blanket for warmth, gathering water, signalling. Beverage kit: Tea bags, milk, sugar. Use coffee sparingly as it makes you thirsty. Food: Salt tablets, electrolyte powder for rehydration, gravy, stock and veg cubes, biltong, dried fruit — basic backpacking foods. Compact torch. Reverse batteries to prevent accidental switch on. Spare bulb, batteries. 50 metres strong fishing nylon, variety of small hooks, trout flies and small lead weights. Fishing nylon can also be used for snaring birds. Basic medical kit: Pain killer; Immodium; malaria prophylaxis/treatment; potassium permanganate (Condy’s crystals), for water purification and for antiseptic purposes — the deeper red it is, the more potent; water purifying tablets; plenty of plasters; crepe bandage; butterfly sutures to close deep wounds; antihistamine; broad spectrum antibiotics (two full courses). Sewing kit: Include strong nylon thread and needles with big eyes for fashioning shoes from animal skins. Pencil, paper: To send messages with a runner, or record route directions etc. Pencils can be sharpened, pens dry out. Signalling mirror (or pack some items in a small tin with shiny lid). Compact binoculars — for searching for game and signs of life and lenses can be removed and used for fire-starting. Sunglasses, hats, extra clothing, hiking boots. Shortwave radio to monitor news of search parties. Ground sheet, wet weather gear. Any signalling materials (see signals). At all times in remote, trackless areas, keep a meticulous log of your journey. Each time you change direction (even on tracks), note the odometer reading and any landmarks and their direction from the vehicle. If you have GPS, enter landmark co-ordinates into your unit, or activate backtrack if you have it. Note the location of any water points, settlements and concentrations of game or of edible vegetation. This may seem very tedious, but could save your life. Do not rely on your memory, and once you have noted a significant landmark, stop further down the road and look back at it — physical features look totally different from different angles. Even if you have GPS, back it up with notes: GPS systems need power to run, and are easily smashed. Cool heads and calm planning are the two critical elements to survival. In Africa, your first priority is to find shade. If your vehicle is intact, this is relatively easy. If the vehicle has burned out, or been hijacked seek shelter immediately — dehydration is one of the biggest problems you will face. Tend to and stabilize anybody who is injured. If anybody is panicking, calm them down fast — panic is infectious. Give them a job to do. 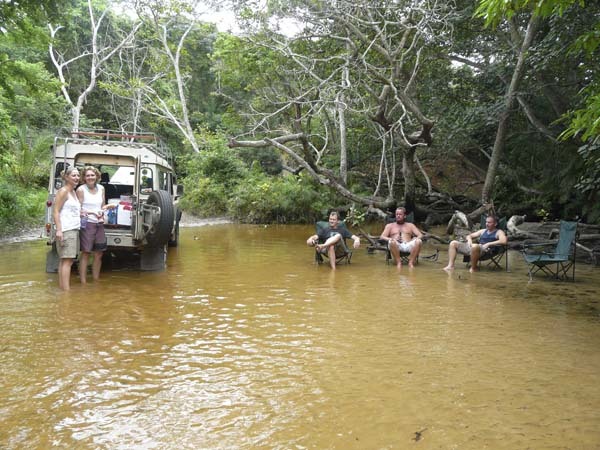 Establish a base camp clear of river beds, even in deserts, as flash floods are always a possibility. If there were fatalities, bury your dead well away from and out of sight of camp, and clear of any water source. Pile rocks on the grave, both as a marker and to keep scavengers away. Appoint a leader who has the final say in all decisions. If two factions develop in a large party the results will be disastrous: Unity is essential. Map out your survival strategy: Do an inventory of supplies, especially of water. Institute water and food rationing. Work out your plan of action: Are you confident you will be found, or must someone walk for help? Correlate all your data, and try to work out an approximate position. Lay out search and rescue ground signals, prepare signal fires. This is not a decision to take lightly: Consider all options first. How likely is rescue? Does someone know roughly where you are and when you are due out? Is it feasible to walk for help, or will this lessen your chances of survival? If you are confident a search will be launched, a vehicle is far more visible than a hiker. Unless your vehicle has been destroyed or stolen, you have far more survival aids at the vehicle than you can carry on your back. If there are only two of you, stick together, unless one is injured and cannot move and the situation is desperate. Should you abandon your vehicle, leave messages in obvious places — hanging from a tree in a sealed container, taped to the inside of the windshield — giving accurate information about your plans. State date and time of departure, number of people, injuries, compass bearing on which you departed, and an explanation of signs you will leave along the way. As you walk, leave clear signs of your passing — arrows made of rocks or wood or scraped in the ground showing direction of travel, notches on trees, messages in clearly visible containers. Leave footprints whenever you encounter soft sand. 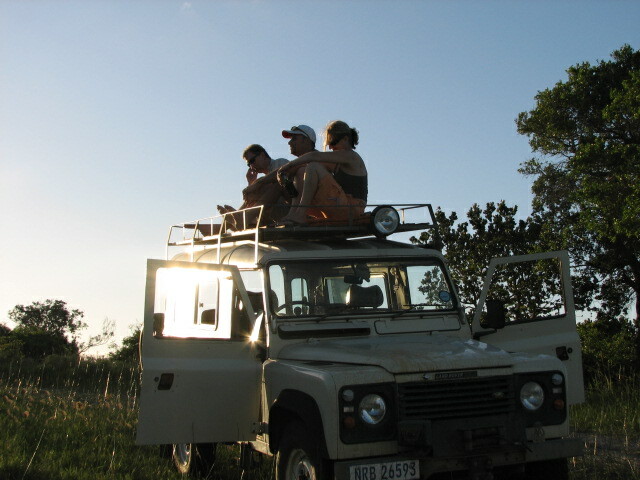 Retrace your journey, returning to the nearest road, settlement or other source of help. If you have no idea where you are, pick up a major water course and follow it up or downstream to the most likely source of help. Never hike in the heat of the day: Find a cool, shady place to rest or sleep, and walk in the early morning and late afternoon. Sunburn and heat stroke are serious medical conditions when you are low on water. Never walk at night unless you are a confident navigator and in deep desert. In the dark, walk slowly and test your steps carefully. If you are descending a slope, shuffle, don’t take steps. If you are in a group, never separate: The pace must be dictated by the slowest walker — position a strong walker at the back to keep tabs on weaker members and the front pathfinder must be the best navigator and most experienced hiker. Keep detailed notes in case you need to retrace your steps, and frequently look back at landmarks. Even if there is little hope of being seen from the air, prepare ground signals — commercial pilots overflying remote areas will notice anything odd and report it. Groupings of three signals will be immediately recognized by any professional as a cry for help: Three blasts on a whistle, three gunshots, three fires. Signal fires: Gather plenty of dry kindling and wood, piles of green leaves and any rubber (like spare tyres) to add to the fire, and a can of petrol or paraffin to get the fire going. A pilot will notice a blaze which starts up fast, and is billowing thick smoke. If you have enough material, build three fires in a triangle set well apart from each other, and ignite them one after the other. Ground signals: International distress letters should be at least 10m long and 3m wide, with 3m between signals, to be visible from a high-flying jet. Three metres long and a metre wide will be big enough to be seen from a light aircraft. Ultimately, the size depends on what materials you have. Use the brightest and shiniest materials you have — ground sheets, back packing survival bags, space blankets, sleeping bags. Wood or stones need to be in a cleared area to stand out from the surrounding terrain. If flights cross at night, dig out the letters in the ground, and when a plane is visible, pour petrol into the trenches and light it. In mountainous terrain, position your signals on high ground for better visibility. ALL DISTRESS SIGNALS MUST BE DESTROYED AFTER YOU HAVE BEEN RESCUED OR YOU COULD SPARK OFF A SECOND OPERATION. SOS: The universal signal, understood by all. I: Require urgent medical help, evacuation. The simplest signal, and the one to which all pilots will respond immediately. F: Need food and water. –>: Moving in this direction. X: We are unable to move on. K: Indicate to us direction to move on. Circle or square: Need compass and map. Y: Yes (A for affirmative also acceptable). If no other signalling device is available, lying flat on the ground with arms outstretched above the head indicates a dire emergency. Standing with hands above the head says “pick us up”. The pilot of an aircraft will perform one of two manoeuvres to acknowledge your signals: By day, tipping the wings from side to side in a rocking movement indicates the message has been understood, by night, the pilot will flash green lights. If the message has been received but NOT understood: By day, the pilot will fly in a right-handed circle, and by night, flash red lights. Morse can also be transmitted by tying a cloth or shirt to a stick: For a dot, swing to the right and twirl in a figure of eight. For a dash, swing left, and twirl a figure of eight. Make your dashes slightly longer than your dots — even if you mess up the code, the mere fact of signalling will alert rescuers. via Survival Tips Part 1 – SA 4×4 Community Forum.